The work of David Lee Csicsko is a balanced interplay between pattern, color and form. 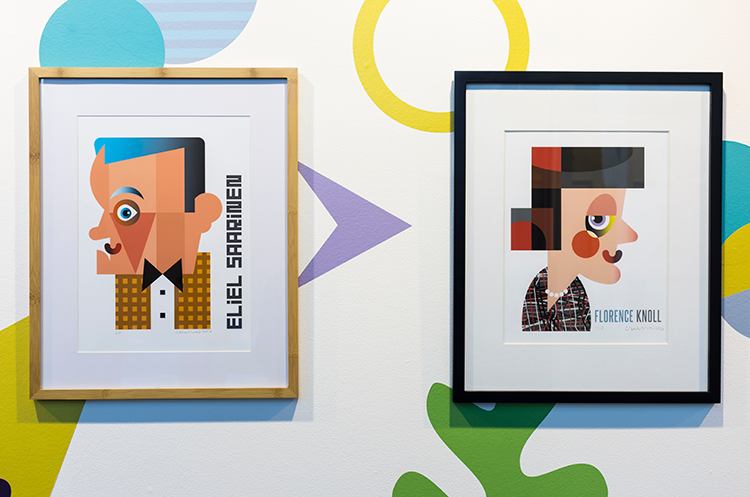 In tasked with designing an exhibit to showcase his most recent collection of portraits, this round focusing on famous designers, whimsy and boldness led the way. A study of the portraits revealed a series of shapes that appeared regularly in the visages Csicsko depicts. These playful figures, including hearts, eyes, and leaves, acted as a backdrop for the main artwork in the gallery. An immersive super graphic of these same shapes, along with descriptive text, introduces visitors to the vivid atmosphere. For the exhibit opening, 'eye masks' were created to provide gallery-goers with another way to interact with the artwork.